Spithill boat — one of the team’s two competing boats — did its finest work. On Nov. 20, the crew finished first in the fleet racing championship, to go along with their match racing win the day before. Winds through the week measured in the 8- to 12-knot range, but kicked up to 14- to 16-knots Sunday, with gusts up to 20 knots — ensuring that the fastest racing of the week came on the final day. exploded off the starting line to lead the fleet of nine AC45 boats into a tense, action-packed turn at the first mark, just a few hundred yards away. Artemis Racing, which worked its way up to the front of a very tight pack by the top gate. ’s Spithill crew chose the favored mark at the top, and was soon leading the fleet downwind at speeds near 25 knots — slowly extending away from the pack of boats giving chase. The week-long event featured top sailing teams from around the world sailing on San Diego Bay aboard one-design 45-foot wing-sail catamarans, in the third leg of the America’s Cup World Series. Museum and on the bay, with boaters opting to view the races from the water forming a line of yachts and charter boats along the outside boundary of the racecourse. While course layouts were changed throughout the week, depending on the wind, many of the races started or finished a mere 100 yards from the end of the Broadway Pier, where a grandstand was erected to provide an unobstructed view of the action. Spithill boat took first and second place in the AC500 Speed Trial, prior to the fleet racing championship, where teams pushed their boats to the limit in an attempt to measure the fastest clocked speed. juggernaut. Spithill overtook the time set by the Kiwis, but Bundock quickly followed with a speed of 28.67 knots aboard the Coutts boat — which stood as the winning speed. 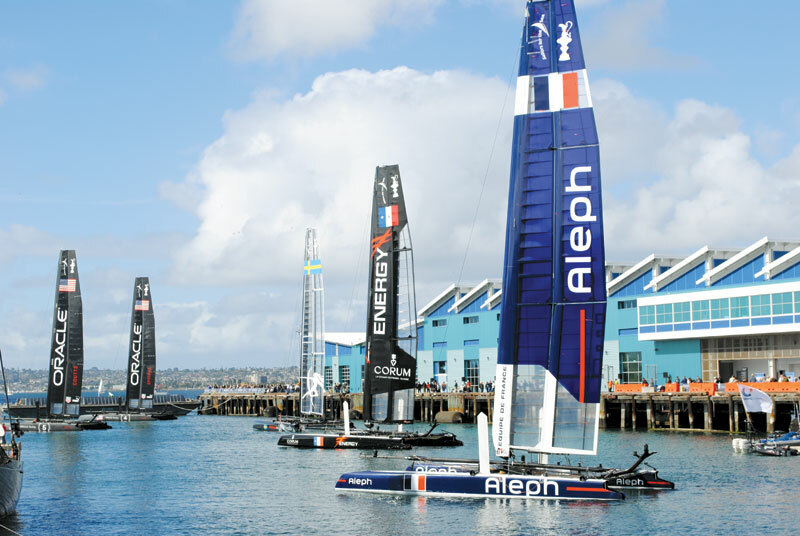 San Diego is the last event of the calendar year for the America’s Cup World Series. So far, the teams have traveled to Cascais, Portugal and Plymouth, England. The teams will now have four months of winter training before the next AC World Series stop in Naples, Italy, April 7-15, 2012. An event in Venice follows, May 12-20. “We’re going to go to some fantastic venues,” said regatta director Iain Murray. “The America’s Cup World Series has grown legs of its own; it has proven itself as a concept. It excites the people, we fit it into the geography of the bays and creating the stadium racing means we can broadcast our racing from the inside out.